Stinky trash is not a pleasant smell. Either is the overwhelming fragrance of some of the trash bags. Hefty Unscented Odor Block trash bags help neutralize garbage odors with no additional scent. I’m always shocked at the prices of trash bags when I visit the store. However, with a sale and this coupon you can score a good deal on these trash bags. 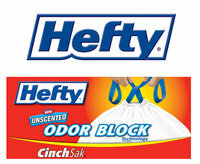 Hefty has a $1/1 printable coupon for you so you can try the Hefty Odor Block trash bags for yourself. Watch this fun commercial from Hefty about scented bags vs. unscented bags. Would you like to win a $50 Walmart gift card so you can purchase Hefty Unscented Odor Block trash bags? Hefty is offering one lucky Bargain Briana reader a $50 Walmart gift card. 1. Leave a comment on this post. 2. Become a Facebook Liker of Bargain Briana and Hefty Trash Bags on Facebook. Giveaway ends 10/5/2010 at 11:59 p.m. EST. This giveaway was sponsored by Hefty. Post was written 100% by me and was not edited by the sponsor. Read more on my Disclosure Policy. I love BargainBriana.com and WalMart!! Hope I win!! OH, the odors we create in the garbage can! Thanks for the chance!! Would love this. Oder Lock Hefty is my #1 brand and walmart has the best deals by me in michigan. Love your site! So helpful for deals! nice site hope to win! Love your site! hope to win! I use Hefty and do not like Walmart because they did not take my internet printed coupons from redplum.com, coupons.com…..and would even try to scan them….Dry Ridge, KY…..Walmart….wooooo…Walmart. I would love to win the trash bags and gift card!!!! I love your site!! I got all of the pampers codes and send info to my freinds frequently!! They love it too!! Thank you so much! And hope to win!! I susbscribe to your blog and love it! I’m a facebook liker of you and Hefty! I too am surprised at the price of trash bags! Thank you for this! Oh and I get your emails! Thank your for the giveaway. I would love to win the gift card. I would love to be able to win the gift card! I’d love to win! Thanks! i’ve been wanting to try those odor blocking Hefty bags. We always use Hefty bags for our trash. I am now following feed via google reader. I am a fan of both on Facebook. Very nice contest…Thank you for the chance. Hefty products are great round the house & for camping !! I like you both already on Facebook. A $50 gift card would definitely come in handy! Thanks for this offer. I liked your websites on Facebook. became a facebook liker of bargain briana! Unscented odor block bags are a great idea! Thanks for the giveaway! Hefty has the strongest bags. Love the idea of a “no odor” garbage can! I would love to win the $50 gift card to get a jump on Christmas shopping and Hefty is the brand I use. Great giveaway. Thanks for making couponing FUN and saving me $$. Thanks also for the opportunity to win! Thanks for the giveaway – a new Walmart opened up down the road from me. I expect to be starting my holiday shopping soon and a gift card to Walmart would certainly come in handy! I’d like to enter the giveaway. Thanks. Argh I meant to say email follower! I would love to be entered thanks! I’ve done all 4 method to win. Thanks ! Thx for all that you do! I’m a fan of you both on FB as “Jay Cee”. I am a Facebook Liker of Bargain Briana and Hefty Trash Bags on Facebook. I would love to win this GC. Hefty bags are the best. I like both of you on facebook! Awesome! Would love to win! I follow you both on facebook! I like Bargain Briana and Hefty Trash Bags on Facebook. Thanks for this awesome giveaway, I need some Hefty bags from Wal Mart something fierce. I trust Hefty to do the job….no mess on the kitchen floor when you remove these bags!!!!! I usually use store brand but would love to try Hefty! I am a fan of both Bargain Briana and Hefty on Facebook (Megan Zinser Allan). $50 could buy a lot of trash bags!! Thanks for the fun way opportunity to get a not so fun product! I could sure stock up on trash bags with 50.00. Thanks for the chance to win! Winning a $50 gift card for Walmart would be so appreciated. It would certainly buy several Hefty Unscented Odor Block trash bags & who knows what else with that gift card. Sounds good to me! I am a subscriber of your wonderful free newsletter. I think I might try these new trash bags. Sure would like to win gift card. i could use this both for some hefty garbage bags but also for some diapers to put in them! Love Hefty and Bargainbrian (great site)! I would love to win the gift card my sister is working so hard on a benefit for me she is trying to get gift cards for the baskets. I really like to give her the gift card to put in a basket to raffle at my benefit. Huge fan, love your site! love walmart and hefty! this would be a nice win! I liked you and Hefty on facebook. I am an email subscriber!! This prize would be great for my sons smelly diapers. I’d love to win this!!! Would love a chance to win. We need new trash bags. Garbage bags are so expensive. Thanks for the chance! I do subscribe via email. I am a facebook fan too! Hefty Trash bags are very reliable. I ‘like’ you on Facebook. Ooh! A really useful item for a giveaway – thanks! Great giveaway, thanks for the chance! Thanks for the great giveaway. I would love to win. Would love to win. Thanks for the opportunity! I like Hefty and BB on FB. I subscribe to your daily e-mails. Walmart just so happens to have the best deal on Hefty. I would love to win the $50 Wal Mart gift card! In addition to Hefty trash bags, I would price match their produce. I “LIKE” Bargain Briana on Facebook. I “like” Hefty trash bags on facebook. I am a confirmed e-mail subscriber. I like Bargain Briana and Hefty Trash Bags on Facebook (catalina khalaj). I already subscribe to your great emails!!! LOVE IT! I LIKE Bargain Briana and Hefty Trash Bags on fb!! I’m very fond of WalMart and could definitely use some new trashbags. Thank you for hosting this giveaway. We take out the trash everyday!! It amazes me how much trash accumlates. I really need to start RECYCLING< REDUCING<REUSING more! I would love to win this…we need trash bags. I use the scented bags. I like the strength, especially when changing the litter pans. I would love to win the Walmart gift card! I have been meaning to try those Hefty bags, too. Thanks! I’d love to win this gift card! Like you and hefty on Facebook. Hm. Do these ‘odor block’ bags block the odor as they are sitting in the can in the kitchen or just when they are closed? If the latter they might come in quite handy. Thanks for the giveaway. WOULD LOVE TO WIN THIS ONE. GO HEFTY!!! Love Walmart and Hefty. Thanks for the chance to win! SUBSCRIBED VIA FACEBOOK LIKED HEFTY BAGS ON F ACEBOOK TOO. Would love to buy trash bags again, we have only been using plastic bags from the store to cut expenses! These odor shielded unscented sound great! I “Like” you both on facebook. I would love a gift certificate to buy some trash bags!! Generic bags just aren’t worth the savings. They’re more likely to tear causing you to use a second bag and waste time picking up the “spillage”. Thanks for the giveaway! really like hefty odor blocking bags! love Walmart! woo,hoo! Love your website!! Love Walmart too!! Go to both places all the time!! i also liked Hefty Trash Bags on Facebook. Thanks for the chance a a great prize…love your blog! I like Hefty trash bags on Facebook. Thanks for another change to win! I would like to try these bags. Thanks for the giveaway. I like you and Hefty on Facebook. Thanks for the giveaway. I would like to try these bags. I just saw that I was supposed to ‘like’ Hefty on facebook too…just did it. I’m always shocked at the price of trash bags, too. I mean, you’re only going to throw them away, right? I am definitely going to be looking for these! Thank you! I’d love to win a $50 Walmart gift card. Would certainly come in handy this close to Christmas. These trash bags were made for my household! I am already a subscriber by email. Like Bargain Briana and Hefty trash bags on Facebook. Wow – this would be awesome to win. Thanks for the opportunity. I like the odor blocker idea! Thanks for the chance to win this great giveaway!! LOve the commercial for this product! What a great prize!! I am a hefty garbage bag user and I love shopping at walmart. thanks for the chance to win – we love hefty in our house! thanks for all the great giveaways. I am an email subscriber. Thanks! Great giveaway. I’d love to win! Would love to win a Wal-Mart card to buy my essentials! Excited to be entered in this giveaway! Awesome giveaway. Count me in. thanks for the chance, I would love to win this! Wish I had that coupon when I bought trash bags yesterday! I subscribe to google reader. I love hefty Thank you for the contest. I’d like to try these. I don’t like the scented bags, so this seems like a good alternative. I would love a gift card and some hefty trash bags! Thanks! I already subscribe through RSS feeder. Wow,I hope I win this!!! I have so many birthdays and holidays to buy for and I am so broke!! !Got my fingers crossed.Wish me LUCK!!!!!!!!!YAY! I already subscribe to you via RSS feed. A gift card to Walmart would be a wonderful thing to win!! I’d love to win. Thanks for the giveaways! I need these for the trash can in the kids bathroom! and I like you on Facebook too! Hi, $50 walmart card would be great! thanks for all the great deals! Hefty is the only bags I will buy. Would love to win! Thanks so much. great giveway. hope i can win, but good luck to all! We always use Hefty bags. I also follow both Hefty and you on facebook. I subscribe to your email. I tweeted about this giveaway from 2teens2mother. Facebook liker of Bargain Briana and Hefty Trash Bags. I’d love to buy $50 worth of trash bags – that’d keep us going for a while! I like your blog and Hefty on Facebook! I love Hefty Bags. I love Wal-Mart. I love Bargain Briana. This is my kind of giveaway! I’m a facebook fan of Bargain Briana & Hefty. Subscribe to your RSS feed! Love Hefty & Walmart. Thanks! I use these all the time in my kids’ diaper pail. I just bought some but always can use more!!!! I would REALLY love to win this! would love to win. could get lots of great deals with $50! I like Bargain Briana on Facebook. And do subscribe via RSS. Thanks- I agree, I hate how much trash bags (something you buy to specifically throw away) cost!!! We used Hefty trash bags in my house almost exclusively. Thanks for a great giveaway! I really enjoy your daily email updates! Thanks for all of them. I would love to win, Those are actually the bags I use as well~! I just bought a box of the Hefty odor block bags but haven’t used any yet. Yes they were on the pricey side. Thanks a bunch for the great giveaway! I already like you on facebook…..that’s how I found out about this giveaway. Love your site, and please enter me in this contest! I would love to win this gift card! Thanks for offering it. I’m subscribed via Google Reader. I would love to win a Walmart Gift Card. Thanks for hosting this giveaway. Thanks for the giveaway. Hope I win. I would love to win the giftcard!! Thank you for the chance to win…..love hefty and Wal-Mart!!! I also subscribe via google RSS feed. How I would love to win this one! I’ve been speculating about buying odor-blocking trash bags but have been hesitating about the price. We’re having twins in the next month plus still have one in diapers, so let’s just say that we could really use some odor blockage! Thanks again! Love your blog. And thanks for the opportunity to win a GC. Love your Blog and would love the trash bags too. I’m out of trashbags right now….I would love to win the giftcard! Liker of Bargain Briana and Hefty Trash Bags on Facebook. i agree, i hate the price of trashbag!! I’m a fan of Bargain Briana and Hefty Trash Bags on Facebook. I’d love a Walmart gift card! Also signed up for email updates.Thanks for all the chances to win! Like both on FB, and subsrcribe to email. Thanks!! We only use Hefty garbage bags at our house! Also fan of both on FB. I would love to win a $50 giftcard to stock up on Hefty!We only use Hefty trashbags. Ha Ha!! I need to win this b/c I just used my last trash bag today!! LOL!! I like Bargain Brianna and Hefty on Facebook. Just tweeted about the giveaway! thanks. I love Hefty trash bags and so does my son as he is the trash emptier. Love Walmart gift cards too! Use hefty when I can get a good deal – they are expensive! I’m in it for the bargains. I am a liker on FB! Love those Hefty trash bags! Hefty bags have great quality, love them! liker of both on fb. In our small town, WM is the only choice, so would LOVE the WM card. Thanks. I would love to win a giftcard from Wal-mart! Thanks for the chance to win!!! I follow in facebook and in google reader that way I dont miss a thing!! Ooh, I would love a WalMart gift card! Thanks for this giveaway!! Would love to win could always use some odor blocking bags in my house!! I subscribe to Bargain Brianna by email. I recieve your blog in my email. TY! right now I’m smelling some stinky garbage! TY! Nice giveaway! I loved to win. I follow you and Hefty on FB! I subscribe w/ google reader! I’m a fan of Bargain Brianna and Hefty on FB! Hefty is by far the best trash bags out there! I would love to win the Gift Card! I’m a subscriber to your RSS feed. Now that my son is off to college, I’m stuck taking out the trash! Love these Hefty bags! I love your website! This would be a great win! What a great giveaway, thanks to Hefty! I follow you and Hefty on facebook. I am a happy subscriber! Subscribe to you by email= thanks! thanks for the chance, i too hate spending money on something you literally throw away! I love gift cards – thanks! Tweeted this giveaway on Twitter. I aready like Bargain Brianna and Hefty on FB! I am a liker and LOVER of Hefty! I am a follower in facebook. already like bargain briana & hefty!! I’m gonna have fun with a $50 gift card WOO HOO!!! I subscribe to your newsletter too! Hefty is the best trashbag. We buy them at Walmart. Would love to win! Thanks for the giveaways! And I tweeted the giveaway! I got a sample of these in the mail. They really are great!